Yesterday Ryan had some work to do at lab. So the family went together and spent a few hours on campus. While Ryan worked, the kids and I went down to the turtle pond and got some samples of pond water. 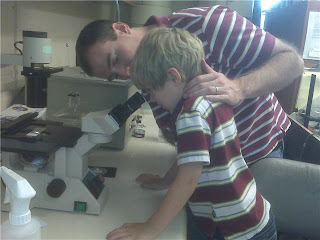 Then we met back up with Ryan and Dylan was able to do a little experiment with daddy to investigate the pond water we collected. 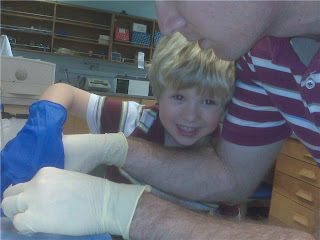 Dylan pulled on some gloves and they got to work. They spun it down to concentrate the gunk into a pellet. Then sucked off the supernatant. 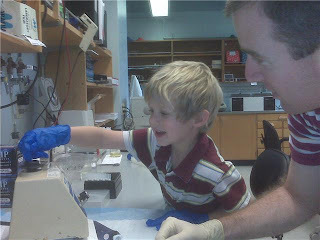 Next they resuspended the pellet and mounted a sample on a slide to see under the microscope. Meanwhile, Addie napped in the stroller. It feels good to be back at Caltech after the past few months. Dylan looks so happy and sweet in these photos! I love his longer hair - he is so cute!